Nearly, 400 years ago, the Chowdhurys settled in and around a small village in Bardhaman and established their Zamindari. With time, they grew to become one of the most influential Zamindars of Bengal. Today, their house, temple, mango orchards and the Dighi (pond) stand testimony to the grand past. If you are a time-traveller, then you must visit the Chowdhury Zamindar Bari this weekend to re-discover the grandeur of Zamindari lifestyle and the beauty of rural Bengal. 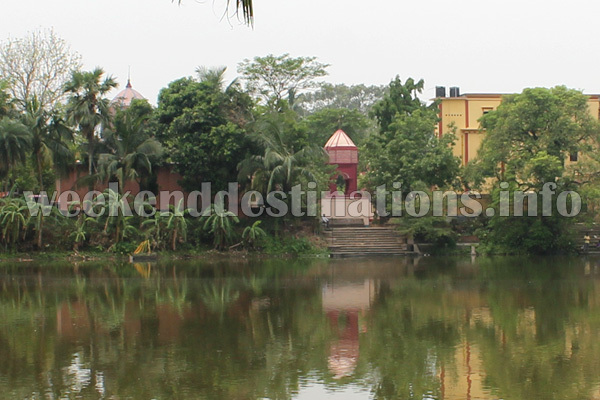 Places to see near Chowdhury Zamindar Bari: As with most of the Zamindars of their time, the house of the Chowdhurys is also located beside a huge pond (Dighi). This vast expanse of water is surrounded by the Radha Madhab Temple, Dol Mancha, Durga Mancha and the Zamindar House on one side and a mango orchard on the other. The Radha Madhab Temple is as old as the house and till today the presiding deity of Lord Krishna and Radha is worshiped everyday – an unbroken practice spanning three centuries. The Durga Mancha, where the Durga Puja and Kali Puja is held every year also dates back to the early seventeenth century. The village Ratha also stands near the village school which itself is nearly a century old. 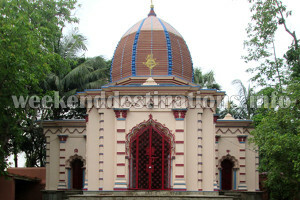 Nearby attractions of Chowdhury Zamindar Bari: There are a number of terracotta temples in the surrounding villages of the Zamindar House. You can also visit the local Nisanka Ashram and a few centuries old Banyan Tree here. Another similar abandoned mansion nearby is Bag Bari, which has a fascinating facade with statues of lions mounting over it. 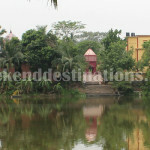 If you have a day to spare, then try a local sightseeing trip of Bardhaman Town. A day trip to Curzon Gate (Bijoy Toran) and the Christ Church built in 1816 around 30 kms. from Chowdhury Zamindar Bari would be very rewarding. 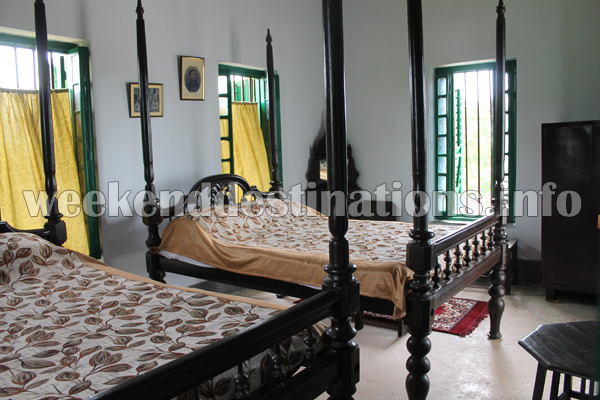 Things to do at Chowdhury Zamindar Bari: The best way to imbibe the true flavour of the Zamindar Bari is to take a long village walk. You would come across the mud houses, village school, terracotta temples, Banyan tree where you would find the village elders gossiping and the pond. Apart from these, you can spend a quiet morning in the mango orchard which has nearly 200 age-old mango trees grafted and planted through centuries from different parts of India. The farmlands and few patches of Backyard forests also invite a whole lot of birds, so bird watching could also be in your cards. The vast water body (Dighi) beside the Zamindar House is teeming with fish and some Rohu and Katla swimming is this pond can weigh up to 15 kgs. and more. If you are a professional angler or is just trying your hands in the newfound hobby of fishing, then you can bring your fishing gear here and take your chance. How to reach Chowdhury Zamindar Bari: The Chowdhury Zamindar Bari is around 30 kms. from Bardhaman town, near to Nimo. So you can take NH19 (also known as Asian Highway 1 or AH1). If you are coming by train, then there are regular trains connecting Bardhaman to Howrah. Nearest rail head is Nimo. Best time to visit Chowdhury Zamindar Bari: You can visit Chowdhury Zamindar Bari anytime of the year. The winters bring the chill and mustard flowers in the fields whereas the mango orchards are in full bloom during summers. Lodging facilities at Chowdhury Zamindar Bari: Staying in Chowdhury Zamindar Bari is a sheer time-travel experience. You would find photos of royal ladies and erstwhile Zamindars and Rajas enjoying Shikaar adorning the walls. Also, some lampshades from England hanging in all their glory from the ceiling. The Khirkis, Kari-barghas and high ceilings mark the interiors of the house. You can sleep in the four poster beds and enjoy your afternoons with a book basking on an easy chair. As of now, the house can take guests in four of its rooms, which have been decked with all modern amenities like attached western bathrooms, Air Conditioning, Power Back-up and almirahs. Food is served in the dining room in the ground floor and essentially authentic Bengali cuisine.